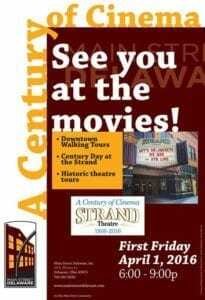 The Strand Theatre on Winter Street in Delaware Ohio is celebrating “A Century of Cinema”, it’s 100th Anniversary! The Strand is an excellent example of a historic theater which has evolved to host the latest in digital cinema. The Strand shows first-run movies as well as special events throughout the year. Main Street Delaware organizes the First Friday downtown Delaware event each month. This month, April 2016, the First Friday event focused on The Strand’s 100th anniversary. The Strand held an Open House and offered Backstage Tours. 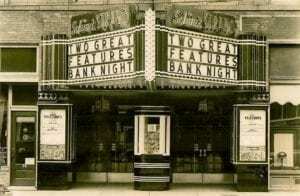 Did you know that downtown Delaware was home to several downtown theaters? Hosted by Delaware County Historical Society, the half-hour tours were packed with downtown history, facts and trivia. Leaving from Main Street Delaware, at 20 E. Winter Street, tour guides Brent Carson and Benny Shoults took each group through downtown. At each site, while gazing on what occupies the space now, showed the tour participants what each site looked like in their theater days. 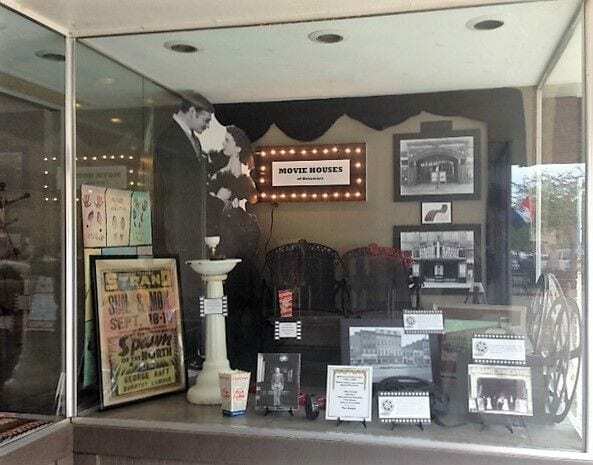 The Sandusky Street display window of The Hair Studio has been transformed into a tableau depicting the historic Movie Theaters of Delaware. Benny Shoults has again created a wonderful presentation of historic photographs and artifacts to bring Delaware history to life. If you are downtown, be sure to take a look at our display in The Hair Studio. While you are there, and ask for “Steve” and thank him for the generous use of the space. Benny wants to thank Mike and Connie Hoffman for lending the Star Theater drinking fountain and Joe Diamond for lending the Star Theater seats. 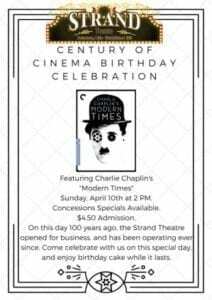 On April 10, 1916, the Strand Theatre was opened by proprietor Henry Bieberson Jr in the New York Cash Store building on Winter Street in Delaware Ohio. 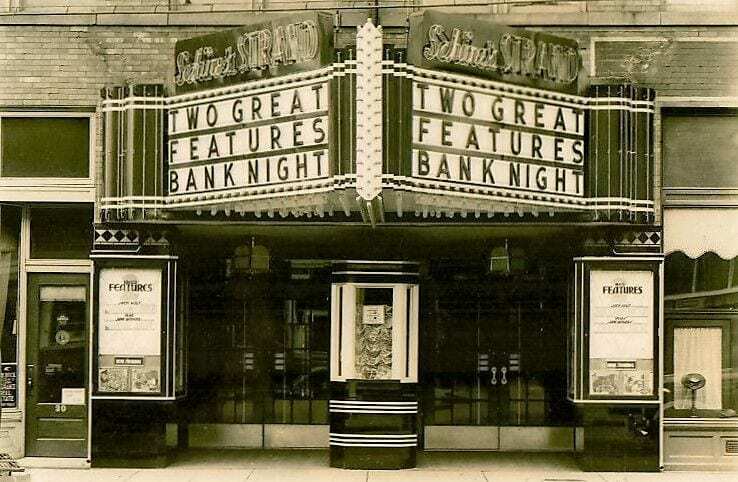 The Strand was part of the Schine chain of movie theaters from 1936 until 1971 when Schine manager George Johnson and his wife Cindy bought the single screen theater. The Johnson’s owned the Strand until retiring in 1994, when Cathy and Jerry Amato took over. In 2002, Ohio Wesleyan University took ownership. 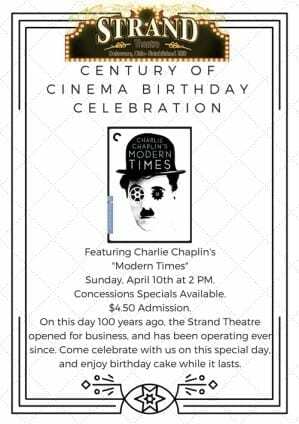 The Strand is now a 3 screen digital theater owned by the Strand Theatre and Cultural Arts Association, a non-profit board. 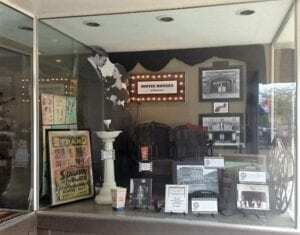 Learn more about Strand Theatre History. A private, non-profit organization dedicated to promoting and sustaining interest in the history of Delaware County, Ohio. The best way, use our Inquiry Form. The Barn at Stratford is just south of the City of Delaware on U. S. 23, about twenty minutes north of Columbus, with easy access from I-71, U.S. Route 23 and I-270. Copyright 2016-2018 Delaware County Historical Society, Inc.